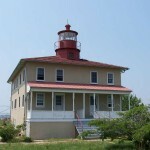 At Point Lookout State Park, formerly a Civil War prison camp named Camp Lincoln, there is a lighthouse that is rumored to be haunted by a Civil War soldier. He has shown up leaning against the door frame in photos taken here. Also here is the apparition of a woman who is searching for a grave. She is said to ask visitors for help locating it. Upon visiting Point Lookout I was unaware of the history/historical value of the location. All I knew was I didn’t feel good. Growing up in Colorado we don’t eat much seafood but my boyfriend was going to show me the way he grew up. After oysters, crab, cod and so much eating in that vacation style I just figured I had overdone it. The deeper we drove into the park the worse I felt. I had to get out of the car. When we stopped and read the plaques I was then made aware not only was it a mass-grave site, but a prison and a hospital I began to understand. When we got home my boyfriend had terrible nightmares and I oddly, didn’t have any dreams. We shrugged it off. Three days later we landed back home in Colorado. While we were sleeping that night, a noise I couldn’t place woke me up. Maybe a few seconds later the television and the surround sound, which have to be turned on separately from two different locations, came BLARING on at the same time. My boyfriend got up and turned them off and we both went back to sleep. Once again I did not dream and he had nightmares. In the early morning hours I was woken by the sound of crying and talking and screaming. I knew they were echoes. My bellyache flared up again and my face felt like it had been smashed in and I kept hearing a man ask for help. I tried to communicate with him but he couldn’t or didn’t want to hear me. He had given me his pain but couldn’t leave his death-state. After trying and trying to talk I couldn’t take the pain anymore and I just yelled that he couldn’t be helped that he had died a long time ago. I yelled for him to move on. Like a clap of thunder the pain intensified and just as suddenly was gone. The house lights flicked and the oppressive feeling lifted. I worked at point look out in the late 1980’s . I only saw a few things that I can’t forget,I saw a blue shimmery cloud move along the back of fort lincolns wall. I was opperating a john deer 1050 knocking down tall grass on the north west side of the moat that ran around the fort on three sides. I was backing up to get in between the trees and I happend to look up towards the rear fort wall.See only one of the buildings were in the fort at that time so where I was moweing I had clear view of the back of the forts wall.It really gave me a good scare . My hair on the back of my neck was standing streight up!! The shape moved at the speed of a man walking at a slow steady speed heading south on the top of the forts wall. It drifted down made a turn started moveing back towards me and just faded away from view. I was just just?????? I had to continue on but I kept a hard eye on the forts wall the rest of the time I was their that day. I always got a feeling like something was watching every time I hoged the forts back field between the fort and the restoration of the prison wall. Rob Mathias parktec saw something or some one in the same area in ragged looking outfit . He saw it , and hit the trucks breaks the secound time he saw it . he would catch it out of his perrifeal vision but when he would turn to look nothing was their. This happened to a few park employed personel at the same time of year early in march before park opened to people. in Hoftmans camp loop ,you can still see the old burial ditches .They run in lines across the camp grounds inner side of the road they would bury the dead . sholder to sholder and stack them three high in long ditches . We were doing some sprucing up in greens camp loop . We were useing a hyd tree spade to dig holes for trees and we came across some cival war era artifacts that we turned in . Their was a lead glass marble with the letter j carved into it . We found three of the marbles and an old belt buckle . The artifacts were turned over to the park service ,but they must have put them in a file box . i never saw the artifacts displayed after that . A lot of the artifacts found would sadly dissapear or would never get displayed at visitors center. I could go on and on about the things I know about the park . So you all have a good knight and the next time you go to the park take a walk around the fort you just might seesomething.